and a small sample was attached. I love the blue and white combination- such a popular colour combination in pottery, which obviously got me thinking! I also love the contrast of the flat image and the raised texture of the lace sample. So much to get my ideas going here! I’ve looked at these sample cards for inspiration in the past, for the Synchronise Exhibition in 2013 when I worked with lace maker JC Middlebrook. I’m drawn back to them again now as I work on ideas of layering and slip decoration. Here I was working on an idea of printing with lace. I painted the lace with slip and pressed it onto the surface of the pot. 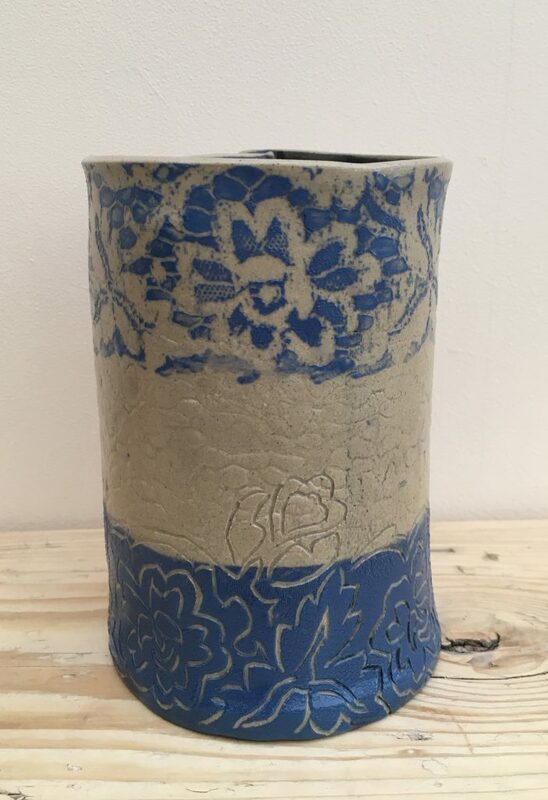 Then I took the floral pattern across the blue panel using sgraffito and finally I scratched an indentation of the pattern on the final plain clay panel. 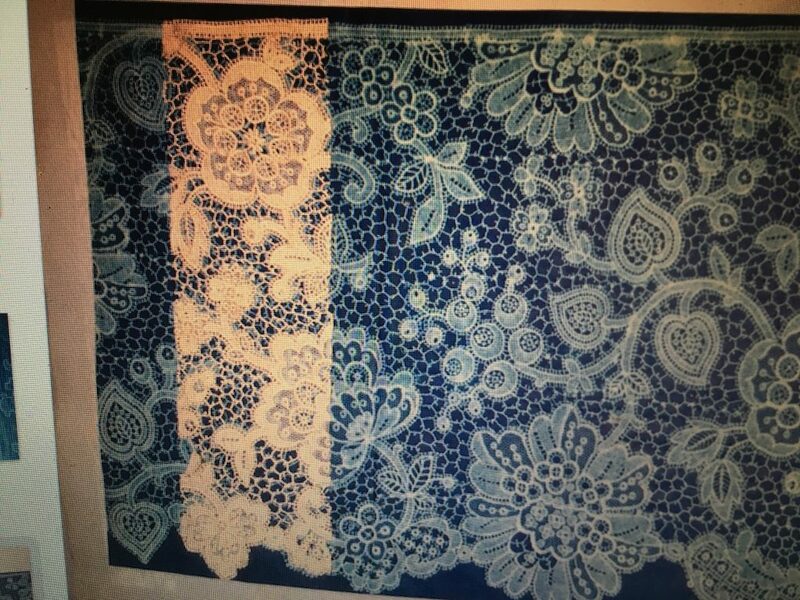 The idea of splitting the design into 3 segments with a single prominent panel was taken from the lace samples. Next I had the idea to paint the slip through the lace to get the pattern onto the surface of the clay. This is pretty effective, I think! 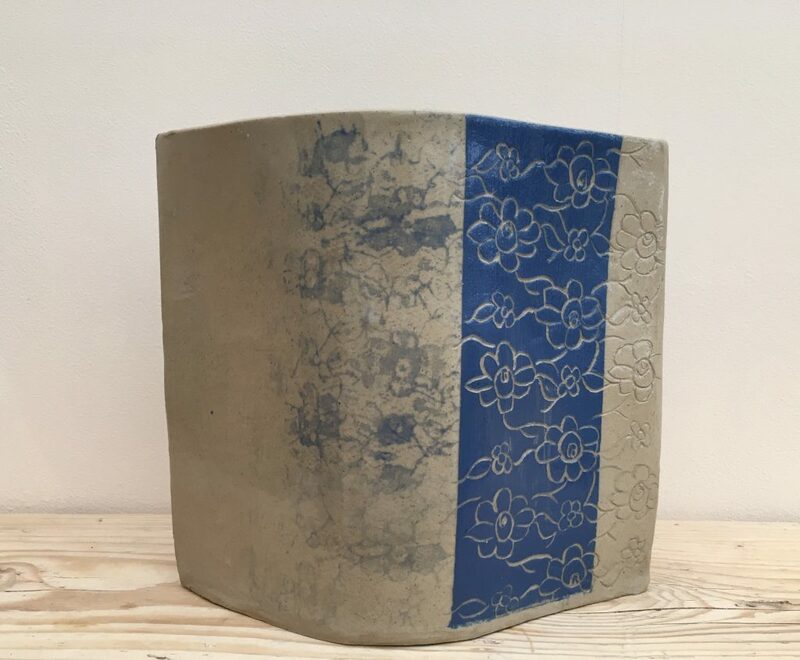 I created this piece as a flat slab and then built it up to a round pot. I imprinted the lace for the central panel and used sgraffito through blue slip for the bottom panel. I wanted to break the straight lines slightly so brought some of the sgraffito up onto the central panel. Breaking the lines between the different segments is definitely something I’d like to take a little further…#designingthroughmaking at it’s best! 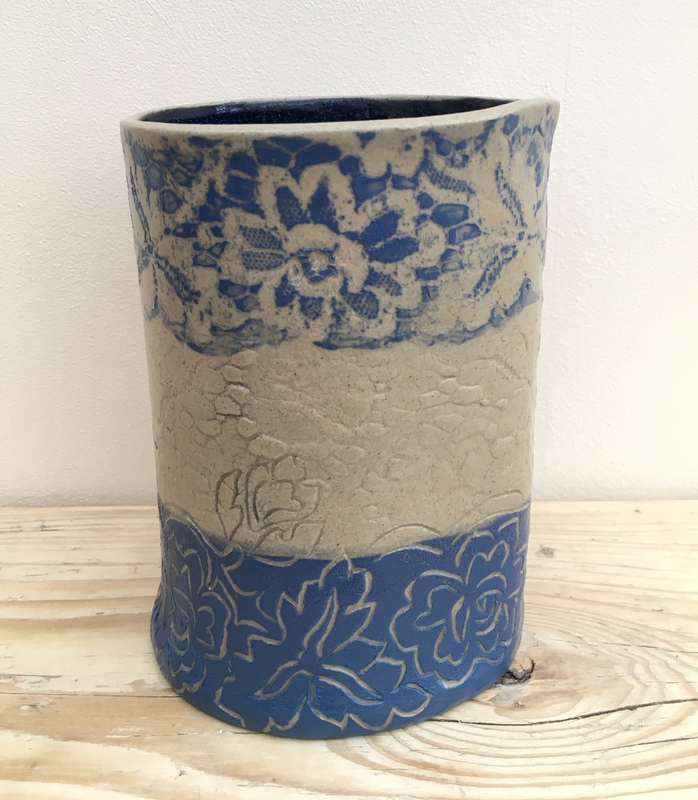 I think my next step will be to explore using white clay, either stoneware or porcelain to revisit my love of the blue and white colour combination. Looking forward to getting the porcelain out again!